October 13, 2017 – NASA is seeking information from U.S. parties interested in operating the Spitzer Space Telescope with non-NASA funding after March 2019, when NASA financial support ends. Spitzer is expected to be able to support its current operations through September 2019, and operations beyond September 2020 should be possible for observing modes with the lowest data volume. “This provides an opportunity for a public-private partnership to continue a highly successful mission,” said Paul Hertz, director of the NASA Astrophysics Division in the Science Mission Directorate at Headquarters, Washington. Spitzer’s mission and spacecraft operations must remain at NASA’s Jet Propulsion Laboratory, Pasadena, California, and Lockheed Martin, Littleton, Colorado. The scheduling portion of science operations and science data processing will remain at the Infrared Processing and Analysis Center at Caltech in Pasadena. The cost for operating Spitzer for fiscal year 2018 is $14 million. 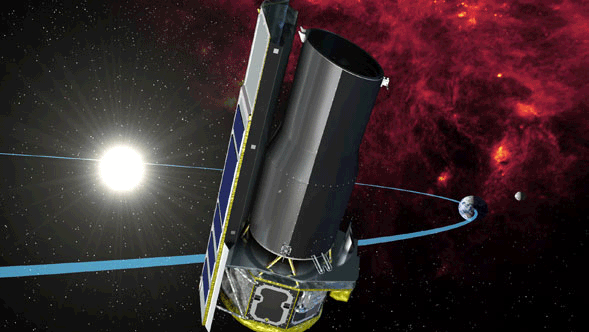 Launched in 2003, Spitzer has pushed the boundaries of space science and technology numerous times while exploring the universe in infrared light. From its prime “cold” mission, it transitioned to a “warm mission” in May 2009 when the liquid helium coolant that chilled its instruments ran out. Currently, Spitzer is in its “Beyond” phase. The name reflects the engineering challenges of a spacecraft getting farther from Earth, as well as its accomplishments. The telescope’s current areas of research include topics it wasn’t originally planned to address — such as galaxies in the very early universe and exoplanets. Recently, Spitzer revealed the seven Earth-size exoplanets of TRAPPIST-1.